The north shoulder of Snow Mountain, as seen from the glacial cirque at its base. This photo was taken during my December 2010 trip. 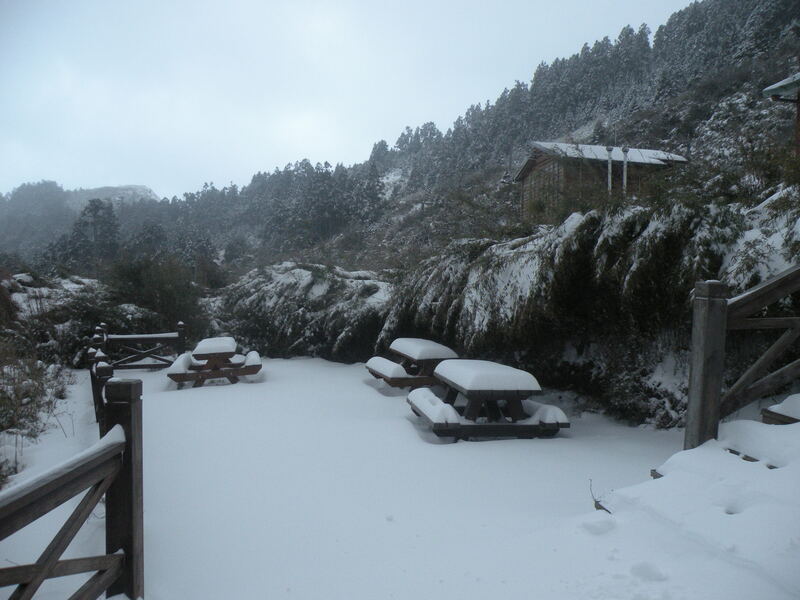 At 3886m Snow mountain (雪山) is the second highest mountain in Taiwan. 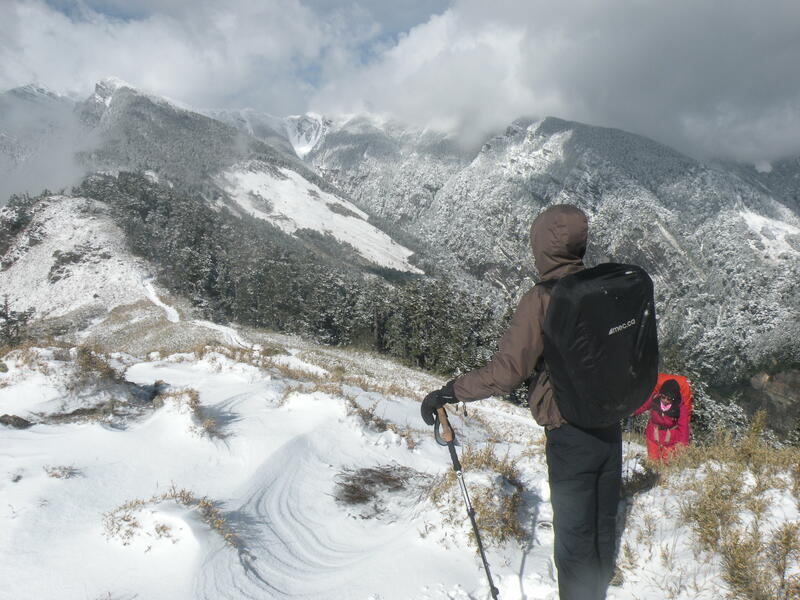 So named due to the heavy snowfall it can experience during the winter, the Snow Mountain trail hosts some of Taiwan’s most beautiful hiking. Across snowfields, into an ancient forest, and finally up through a unique glacial cirque, the east Snow Mountain route takes one through several ecological zones and some marvelous terrain. The mountain had seen heavy snowfall just prior to our trip. Last year, in December, I made a trip to this mountain with a group of five friends. 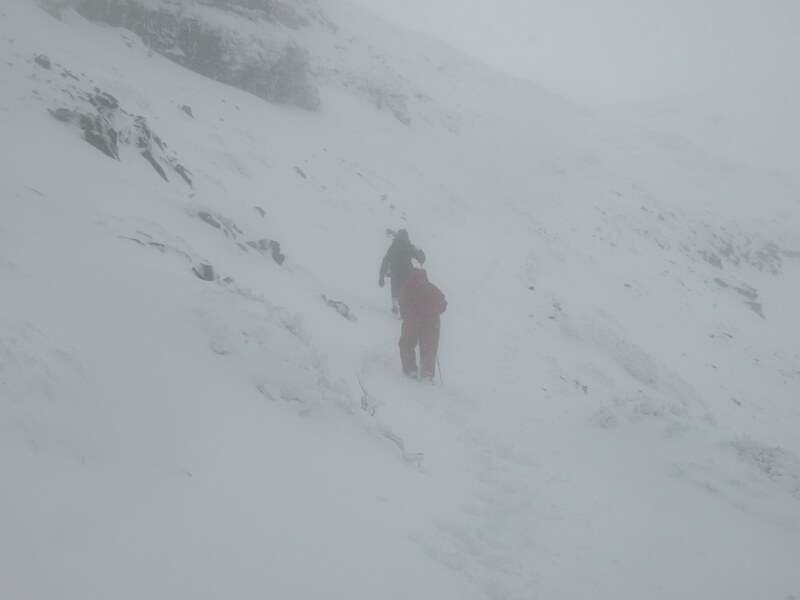 Cold weather and icy conditions made for a real adventure to the summit. This year’s trip promised to be equally exciting. I expected the January weather to present a real winter landscape, and I wasn’t dissapointed. 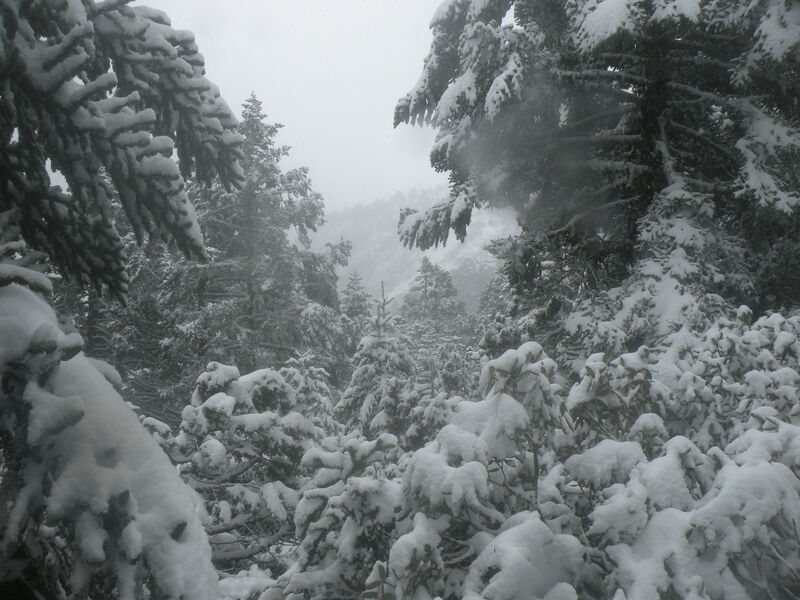 Heavy snow in the black forest. Our three day hiking route. Day 1: We started our trip with a four hour bus-ride from Taipei to Wuling farm in Shei-Pa National Park. 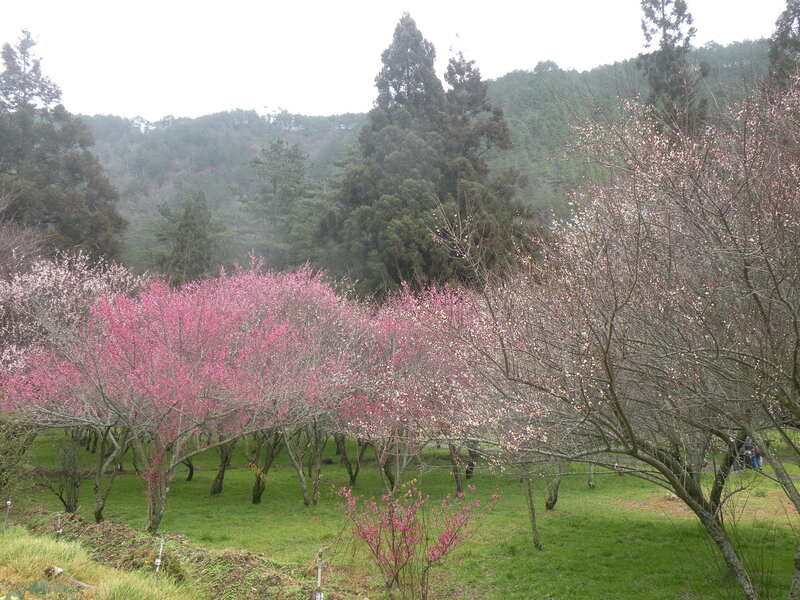 The cherry trees were in full blossom. From Wuling Farm we hitched a ride up to the trailhead. 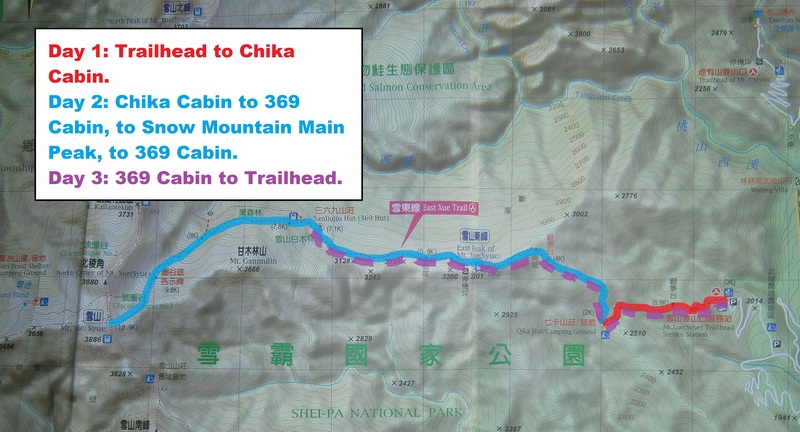 Our plan involved a short 2 km hike from the trailhead to the Chika mountain cabin, where we would spend the night. 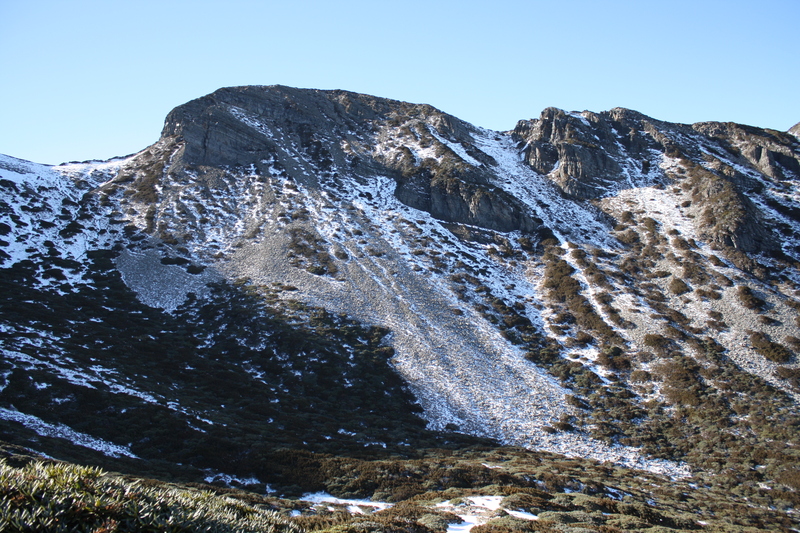 The second day, we would hike 8.9 km from the Chika hut to the summit, and then 3.8 km back down to the 369 hut, where we would spend the second night. On the third day, we would hike 7.1 km back to the bottom. 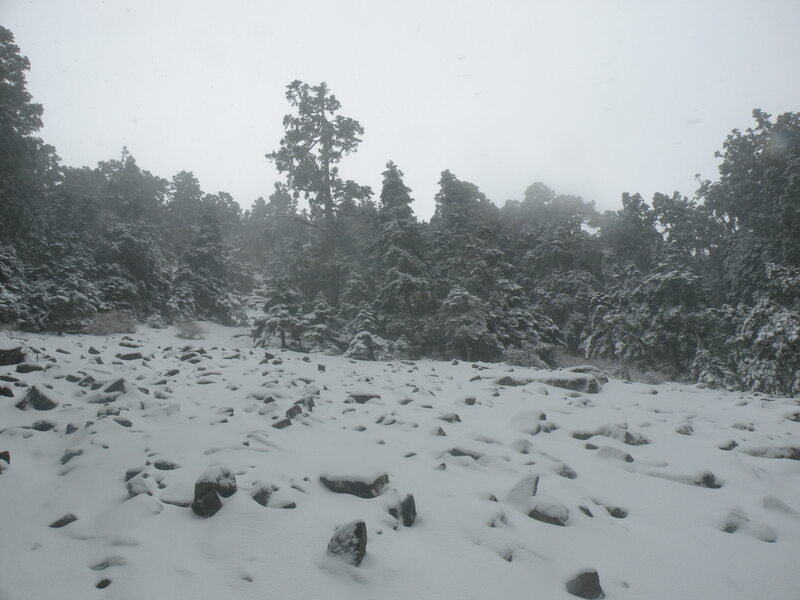 The trail to Chika was short and easy – time permitting it is much better to hike to 369 hut on the first day. 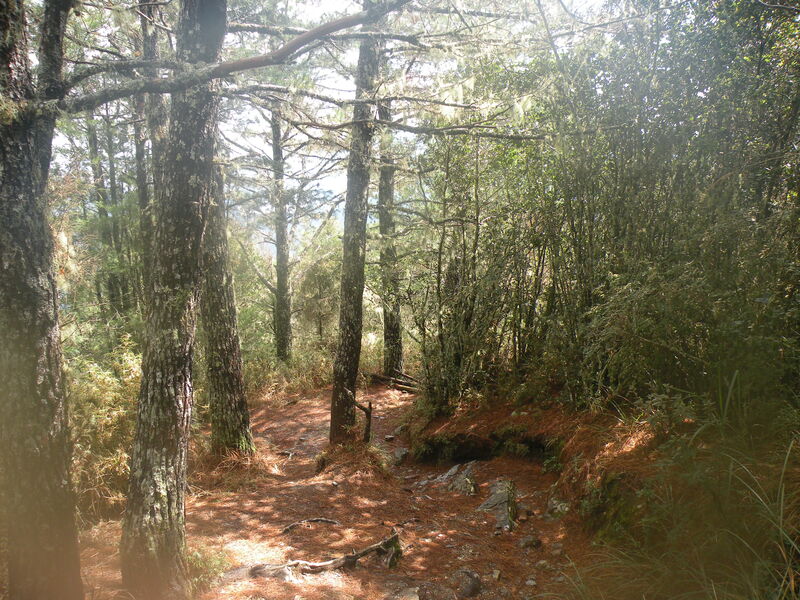 The short trail to Chika runs through some nice forest. The hunchback of Chika Cabin. We had some time to kill! Day 2: At Chika we woke up at 3 a.m., and after breakfast, hit the trail at 4:30 a.m. 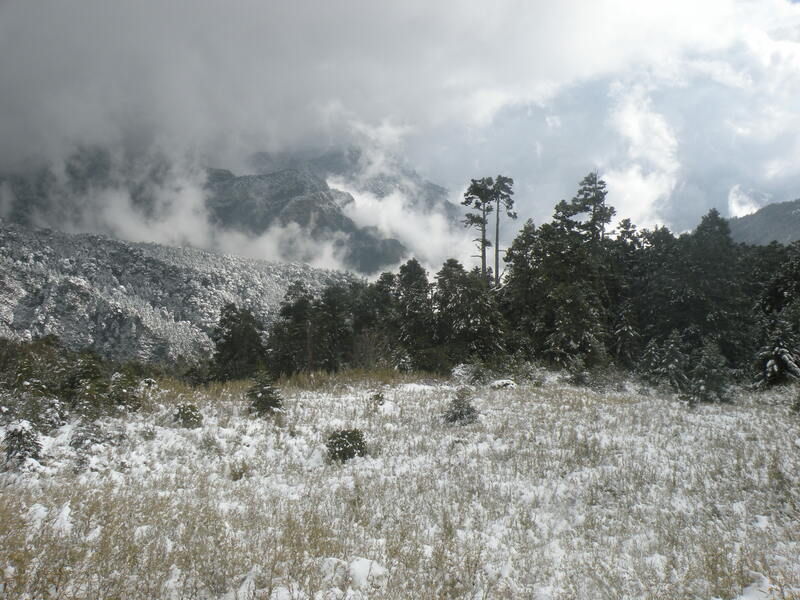 Above Chika, the air became colder, and we got our first glimpses of snow. 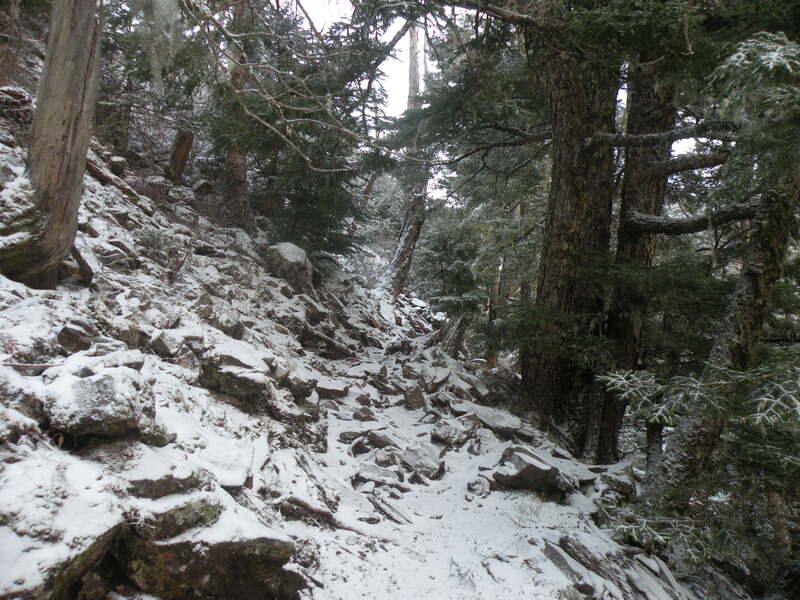 The trail above Chika gave us our first glimpse of snow. The trees were very beautiful. The air wasn’t perfectly clear; a thin mist hung over everything. We reached 369 cabin and found it mostly empty. 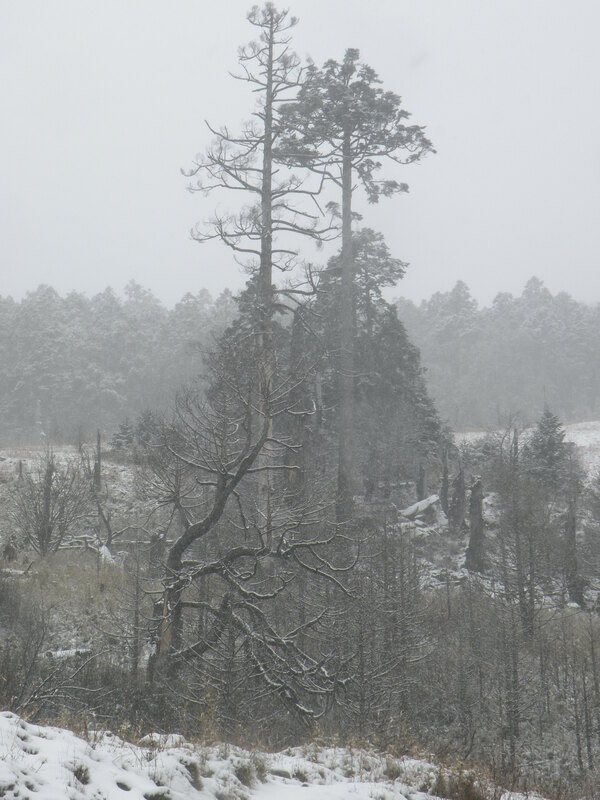 A park ranger greeted us, and warned that the weather had been poor higher up in recent days. 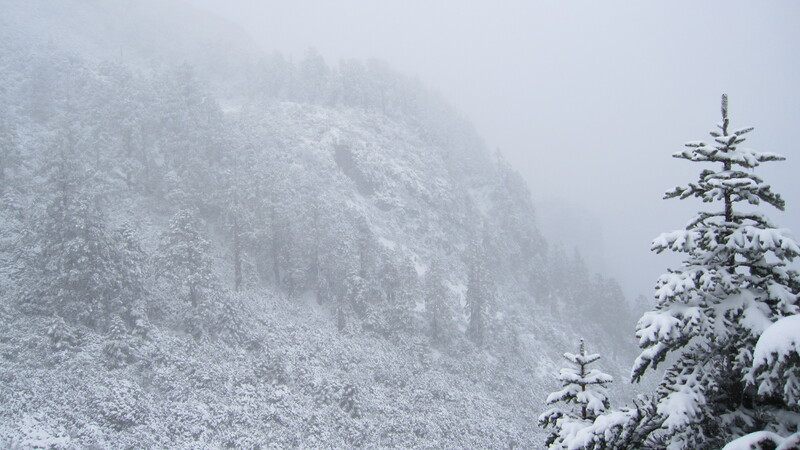 Above the 369 hut, we entered the black forest, a beautiful and haunting place in the winter. On our way through the forest, we met a team of five climbers from Hong Kong, on their way back. They didn’t greet us or smile. 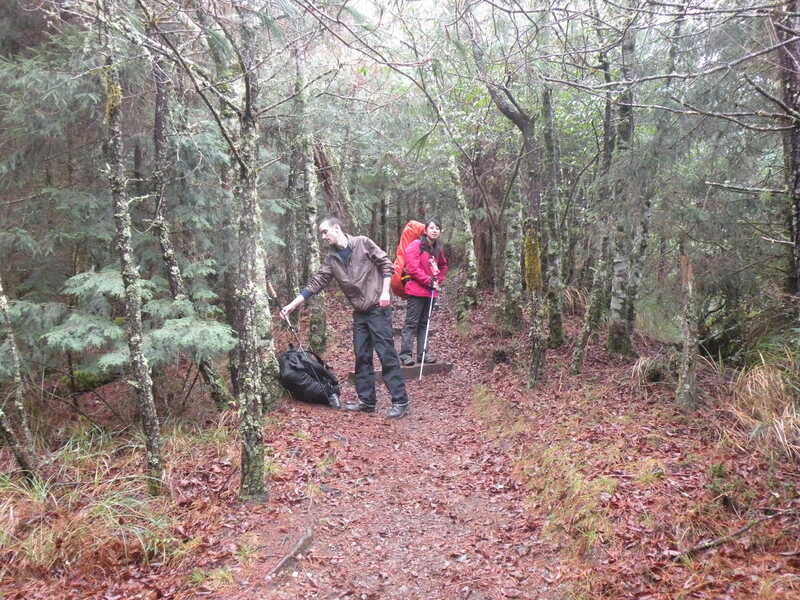 We would learn later that they had gotten past the forest, but had decided to turn around due to the poor visibility. The path through the forest. It was hard to believe we were still in Taiwan! 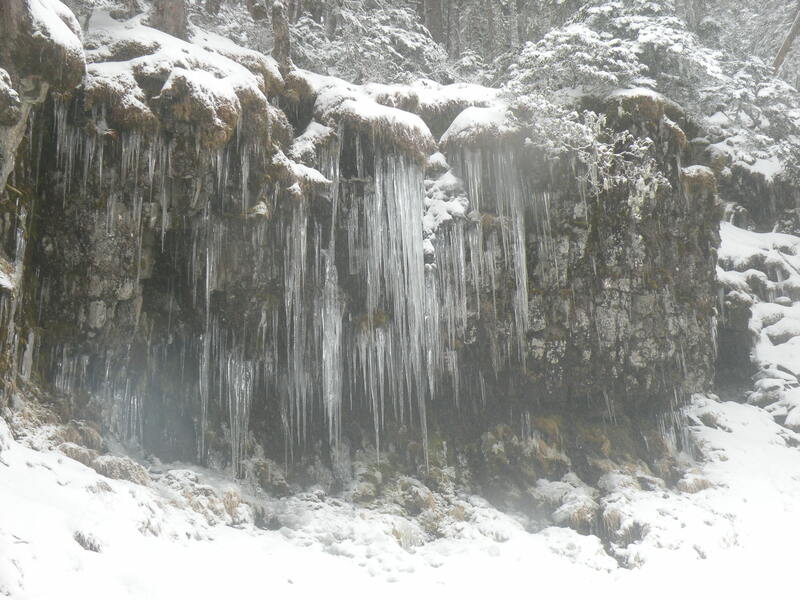 Huge icicles in the black forest. The snow became deeper and deeper. Undeterred, we pushed onwards. 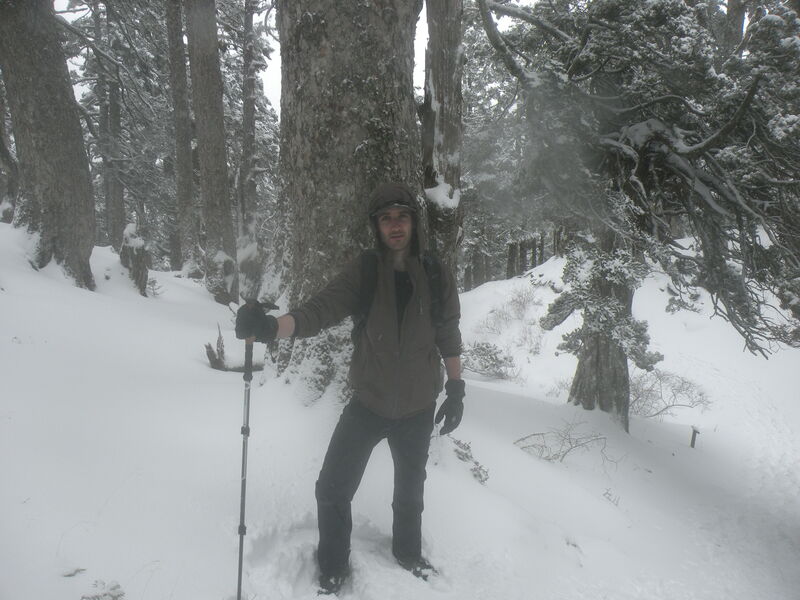 The snow was getting deeper. After the forest we reached the primary glacial cirque, a unique ‘bowl’ formation at the base of the ridgeline which marks the final leg of the route to the summit. 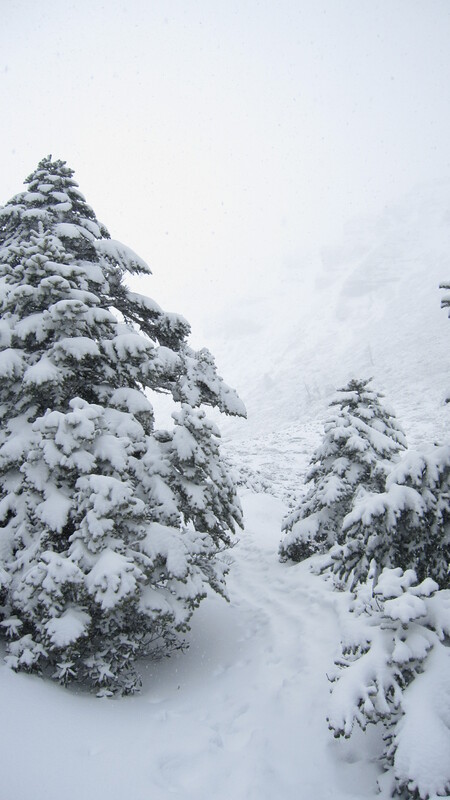 It began snowing when we arrived in the cirque, and in places the ground was covered with a good 2 feet. 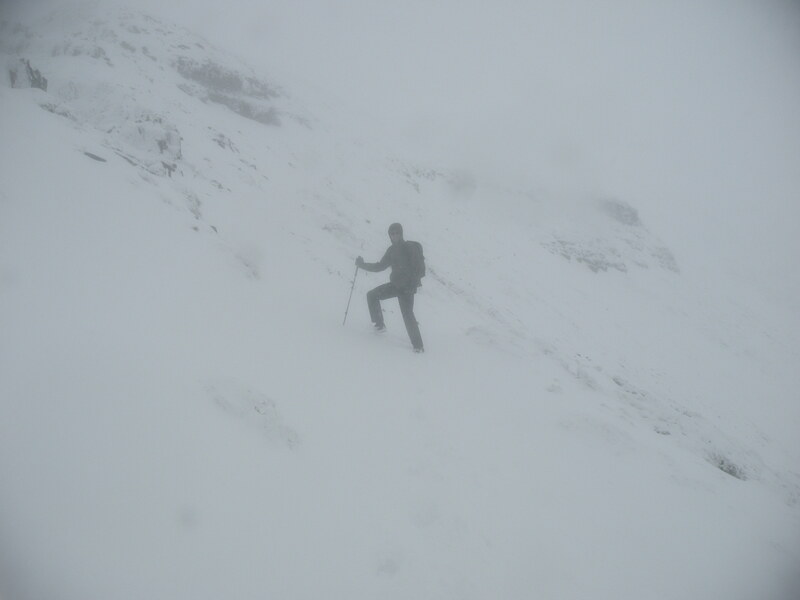 Visibility was very poor, but our spirits were high. At the cirque, the weather quickly worsened. 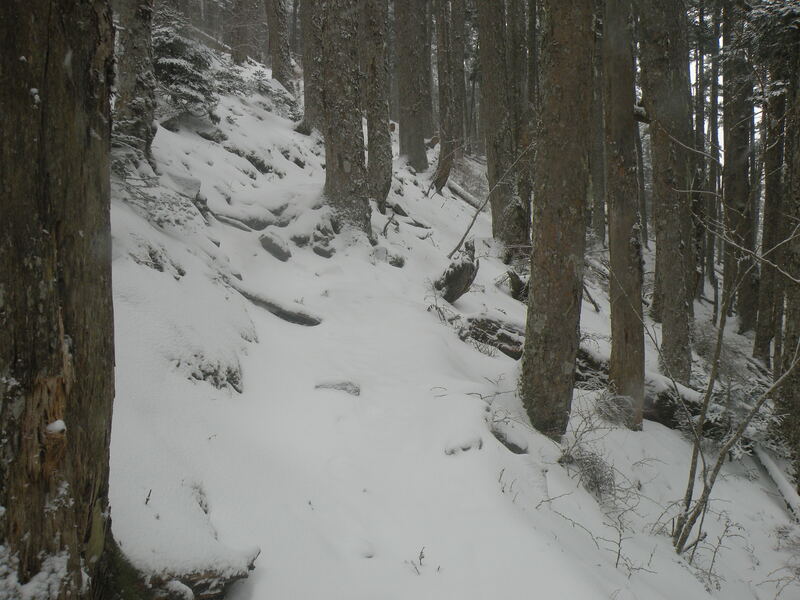 The ridgeline above us was invisible due to the snow, and the trail markers were buried. I had hiked this route before, and knew where we needed to go. We forged along the face of the mountain, headed south-east towards the ridge, kicking and stomping footholds. The poor visibility made the going slow. 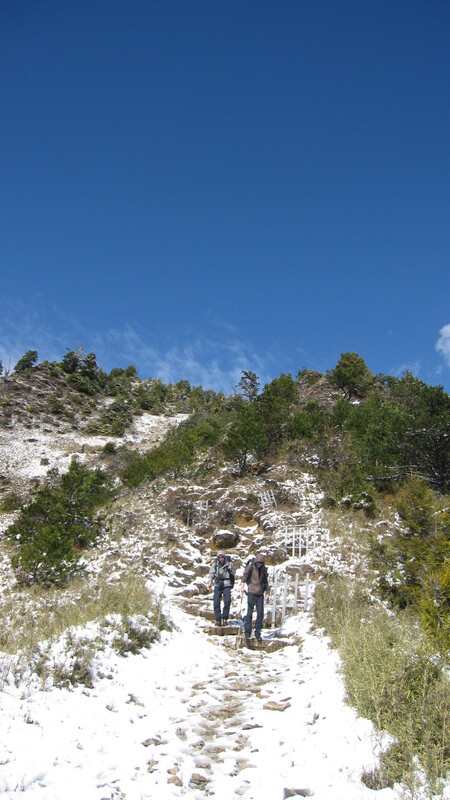 Heading up to the Main Peak of Snow Mountain. Finally, I saw the ridgeline and we burned a trail straight to the top. We were a bit unsure whether we were north or south of the summit – but a quick hike confirmed that we were to the south. Ten minutes later, we were at the peak. All three of us made it, and it felt like a real accomplishment. 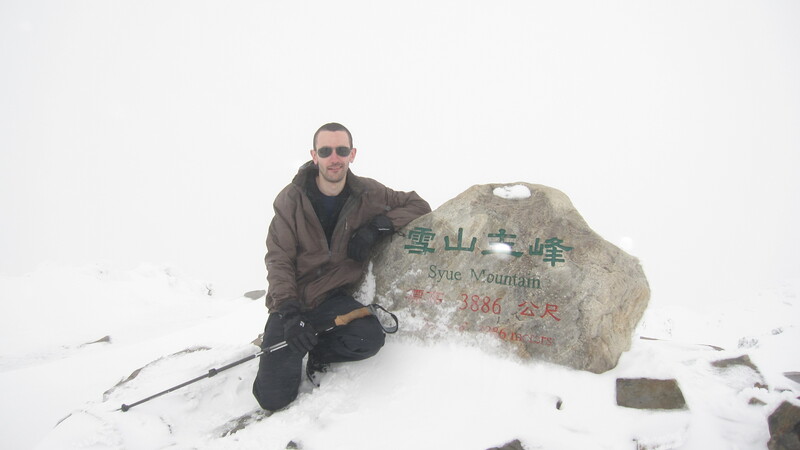 On Snow Mountain Main Peak. We got back to the 369 hut one hour before nightfall, right on schedule. 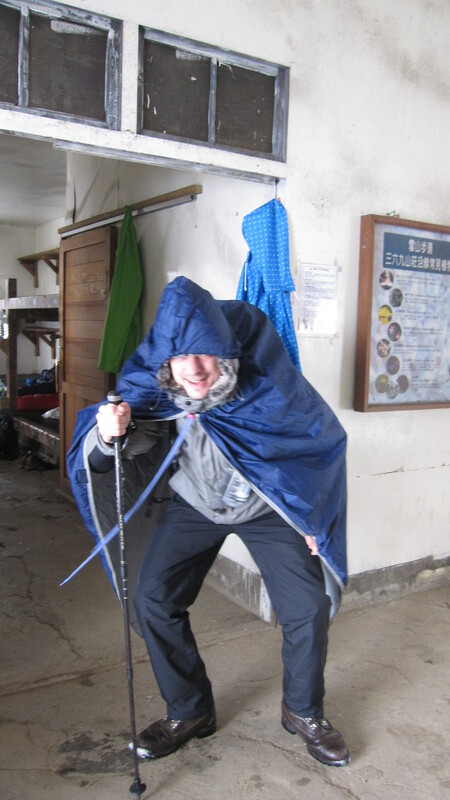 In all, we had been hiking for roughly 12 hours – slow due to the visibility. Day 3: The next morning we woke up at 6 a.m., and hit the trail at 8 a.m. – plenty of time to cook a nice breakfast. On our way down, the weather cleared up a little bit. The Ranger at 369 took off for the summit, keen on what appeared to be a break in the weather. A view of the ridge – the main peak obscured by clouds – on the way back down. Clouds were billowing past, and we had interesting views on the way down. Under blue skies, the landscape was very pleasing. 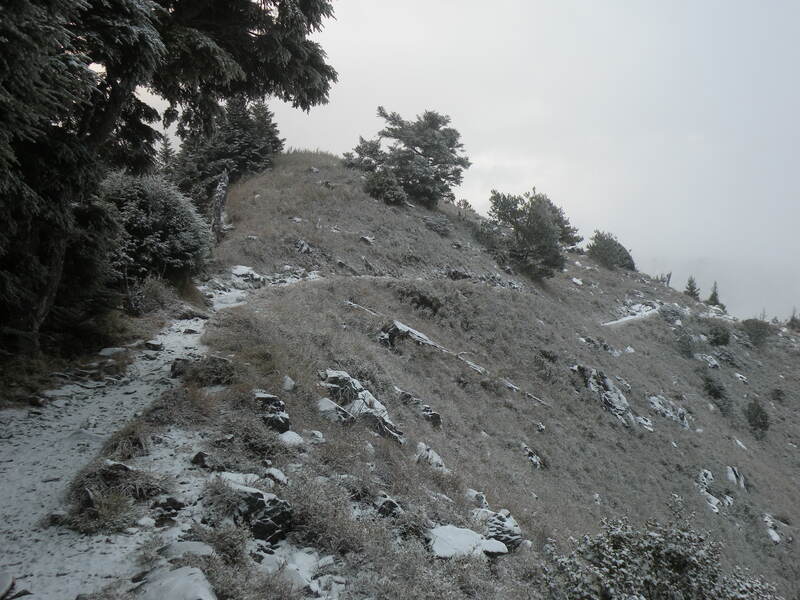 As we descended the air warmed at lower altitude and the snow slowly disappeared. 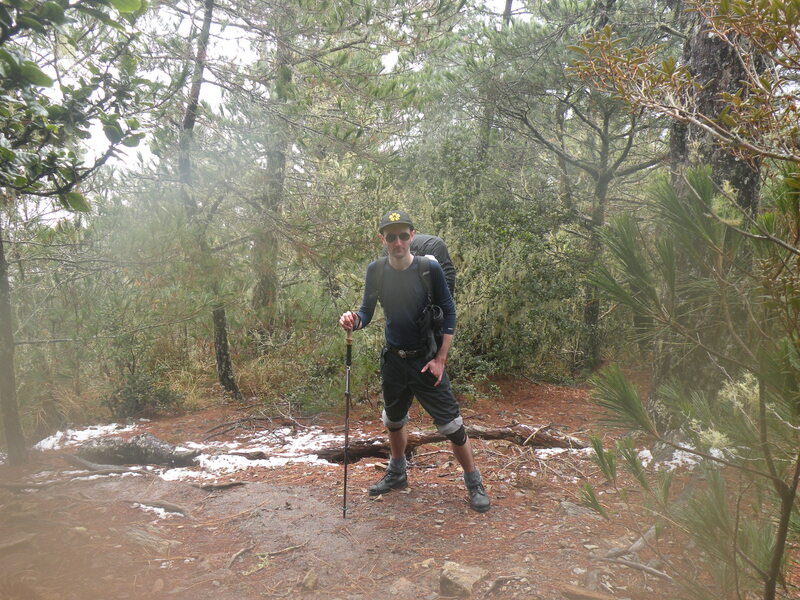 We found ourselves enjoying the sunny pine forest which we had hiked mostly in darkness on the first two days. Lovely sunshine warmed us up. The forest was cool and refreshing. Our adventure complete, and successful, we caught our bus back to Taipei! The 369 cabin is large, and while basic, is fairly comfortable. There is a reliable water source at both Chika and 369. Hut space can be booked online, during the permit application process. 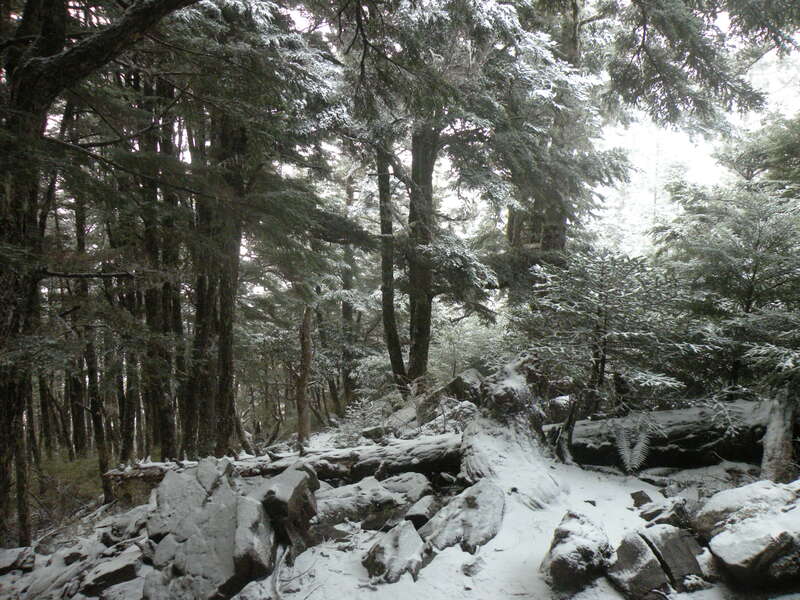 This entry was posted in Hiking, Shei-Pa National Park (Snow Mountain) - 雪霸國家公園, Taiwan - 台灣 and tagged 雪山, 雪山主峰, Snow Mountain, Syue Shan, Taiwan Hiking by Ian. Bookmark the permalink. Hi. Did you avail a travel agency for your climb? We’re only two hiking hoping to.do a diy climb. Do you.know any guide there?